Two weeks seems about right for pineapple infusions. So after two weeks, we once again ventured into the lab to pit our wills against our own creation and see if we could come out still upright, with taste buds intact. We started off by pouring two baseline shots of straight Bacardi Coco for control purposes. Now personally, I've been a fan of this rum for a while. It's one of the few coconut rums out there that still weighs in at a hefty 80 proof. (Unlike the more popular Malibu Coco, which comes in at a wimpy 41 proof. That's not a rum, that's a cordial.) I don't know if I've ever actually drank it straight before, but we must do what we must do in the name of science. So we downed the shots and wrote our reactions. Me: "That's coconut alright. It has a slight burn on the back end, but smooth otherwise. It leaves a slightly unpleasant overpowering coconut taste on the back end, however." Brendan: "That's pretty smooth, though there is some burn. It tastes like coconut, that's for sure. I can't comment on the rum itself, since I'm not that familiar with light rum." So, with our palates accustomed to the "before" phase of our experiment with very similar reactions, we ventured forth to taste the "after." Me: "That's good. The pineapple leaves a sweetness that is absent from the plain Coco. Although, the coconut flavor is all that's left by the back end. This is quality; I wouldn't be opposed to leaving it longer and seeing if we could get more pineapple from it, but I'd be content to take it as it is too." Brendan: "The pineapple flavor is just strong enough to balance with the coconut. It tips somewhat in the pineapple's favor at first, but slides back towards coconut in the end. Most of the alcohol burn is actually cut out on this one. I think it's a success, though I'm afraid most cocktails we us this in would be redundant." After a brief discussion, we decided to declare this one a success, bottled it, and put it on the shelf. Since then, we've actually tried a couple pretty decent cocktails with the rum; but as of yet, those cocktails have yet to be examined with our normal scientific rigor, so the readers will just have to wait to see what I've come up with. We've started the Third Age of IoG with a success and the closing up of loops. Hopefully, that bodes well for the current incarnation. Coming up next - Snickers Infused Vodka! It is a scientific fact that pears are funny-looking. As promised, today we are presenting the results of the remaining cliffhanger experiment from before our hiatus: pear infused vodka. This experiment used the same methodology we developed through trial and error for our apple vodka: we sliced a pear into wedges, infused it for five days, then replaced it with a fresh pear, repeating this twice for a total 15-day infusion. The vodka came out with a deeper, darker color than our apple vodka. "There is definitely a pear-ish flavor to this," Wayland commented. "It's smooth and quite sweet, with no hint of burn. Not quite as much of a pear flavor as I'd like, but I'll call this a success." My thoughts were similar. "This is very sweet, and has a very pear flavor, though it doesn't quite become distinct until the back end. The sweetness is almost too much, but not quite; it's just on the end of quite tasty. I like it." Unlike the apple vodka developed in the Big Experiment, we did not use a spoonful of sugar at the onset of this infusion. It appears that this is a good thing, since it drew plenty of sweetness from the pears themselves. It is possible that a bit more time could have given this vodka a more comprehensive pear flavor, but we're pleased with what we came up with. On Monday, we will present the results of the pear infused vodka experiment. Today's post concerns the other* "lost" experiment, our peppercorn vodka. To recap the starting post of this experiment, we created our peppercorn vodka by pouring a shallow layer of whole peppercorns into a science jar, before pouring 750 mL of vodka over them. We sampled the vodka after two days, and decided it wasn't quite done and gave it another. After three days, we conducted our official tasting. Wayland's reaction was quite clear. "That's got a burn! And not a vodka burn. That's very much a black pepper flavor. I think it's dead on, and very much a success." "This vodka has a strong spice, but also an odd, slight sweetness," I wrote. "The pepper flavor comes through well, despite various warnings that the corns must be cracked, or that the flavor will be slimy." It is possible that the vodka could have been made even better if we had in fact cracked the peppercorns before infusing them. It is also possible that this would have made the flavor too strong. Perhaps one day we will do a side-by-side test to see which method is preferable, but for now, we are quite satisfied by the product that resulted. *Not counting the kiwifruit vodka experiment, which remains unresolved from our first hiatus. We hope to soon bring this one to a close also; I actually found some of the notes for this experiment as well, but I don't remember what happened to the vodka itself. Yes, we.... planned this all along. After returning from hiatus with a new pineapple-infused coconut rum experiment, we discovered that today happens to be Mixology Monday, and that today's MxMo subject is coincidentally rum. So, we're retroactively declaring this morning's post to be our contribution to this time-honored tradition. You can watch for other MxMo participants at this month's host, Trader Tiki's. Ten years after the Earth-Minba--oops, wrong intro. Welcome, readers new and old alike, to the third debut of Infusions of Grandeur. Your hosts, the Mad Scienticians Brendan (that's me) and Wayland, are returning to the laboratory to concoct new vodka infusions, experiment with new cocktails, and uncover new scientific discoveries in the field of Alconomics. For today, however, we wanted to do something a little different. The last time we came back from a long break, we attempted an experiment which delved into liquors other than vodka for the first time. We have always used, as a base for our infusions, the cheapest vodka we could find, which we filter through a Brita or Pur filter five times to remove the impurities; we tested to see if other liquors could be similarly improved. (It was a horrible failure.) This time, we've decided again to experiment with something other than vodka, but we're bringing it back to our core strength: infusions. To be specific, we've decided to infuse coconut rum with pineapple. Okay, sure, so we're flavoring an already-flavored rum. But these are two flavors that we know work well together. We could, of course, infuse plain rum with both coconut and pineapple, but we didn't want to do this without tweaking our coconut infusion methodology first. When we made coconut-infused vodka, it took forever, and though good, it didn't quite match up with our hopes for it. So, this is what we settled on. 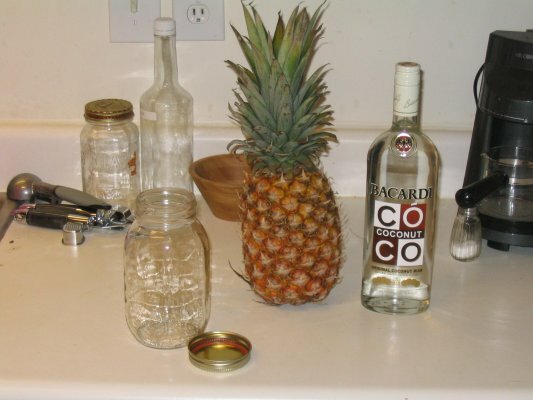 We began with a bottle of mid-grade liquor, Bacardi Coco, and a pineapple. 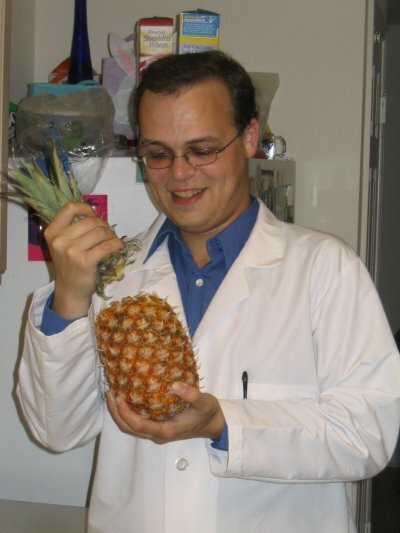 Wayland set the experiment in motion by brutally executing the pineapple with a quick beheading. I cut the skin off of the pineapple, sliced it and cut the slices into chunks. 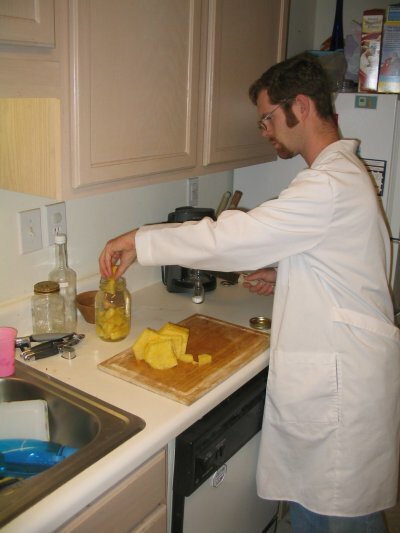 We poured the rum into a science jar and dunked in as many pineapple chunks as we could squeeze in. The rest was stored in our science fridge for breakfasting purposes. Our pineapple vodka took just over two weeks to infuse; we are assuming this will take a similar amount of time. We will update on this experiment then; in the meantime, stay tuned for long-overdue results and some other new stuff. Our re-re-debut has taken a little longer than we originally planned to get into motion, but we are once again donning our lab coats for more vodka infusions and experiments. Stay tuned: the Third Age of IOG will begin on Monday, May 12.